How to Select the Best Slingshot Target? Whether you’re a professional slingshot user who’s actively involved in competitions, or you just like getting outdoors and having fun, a slingshot target is a very handy thing to own. Not only does it allow you to build vital hand-eye coordination but it can help prepare you for hunting further down the line. A slingshot target must be three things: accurate, durable and reusable. Within this slingshot target buying guide, we review five top-rated slingshot targets that fit into some, if not all, of those categories. Your level of investment in slingshot use can very well determine the kind of slingshot target you require. Someone who fires a slingshot as a hobby might only need basic targets, while competition users may need a system that’s more complex and challenging. The target itself is a safe product, however, where you put it is where safety issues can occur. If your target is made out of paper, it’s vital that you have a secure and thick backing board behind it. This stops your ammo from launching through the target and potentially hitting someone. You should also never fire your slingshot at your target in the vicinity of people who could walk into the firing line. The features of a slingshot target can vary. Some are made of a durable canvas-like material on a frame, while others are more temporary and are made out of card or paper. Some can feature one main target or various smaller ones for a bit more challenge. Hitting the target is down to the skill of the slingshot user, however, the material and design of the target should also be taken into consideration, alongside the type of ammo. The thicker the card, the harder it is for your ammo to penetrate the target. However, if the target material is too light, you run the risk of ripping it and losing sight of where you hit. Therefore, it’s best to stick your target to a medium-thickness board and take note of indents to find out whether you hit the target or not. Depending on the quantity, quality and size, you will pay anywhere between $4 and $500. However, you can often get the best deal when you choose to buy online. You get two in a packet. It’s a nice traditional and easy-to-use target. It’s a good size for practice. It fades easily in sunlight. The listing is deceiving. It says the target is made of high-quality materials but it’s simply made of standard copy paper. Champion Traps and Targets target. Dimensions: 12 x 12 x 1 inches. QCan it be stuck on a wall or would it damage it? When you’re looking for a traditional target to practice with, this Champion Traps and Targets target ticks all the boxes. The target is clear, it’s easy to install on any surface, and can provide a challenge for any slingshot user. However, the listing itself is deceiving. It says it’s made out of quality material but it’s only made out of copy paper. Therefore it is easy to rip and destroy. For this false advertising alone, it’s not one of the best slingshot targets for the money. Check out what other people who purchased this product think about it. 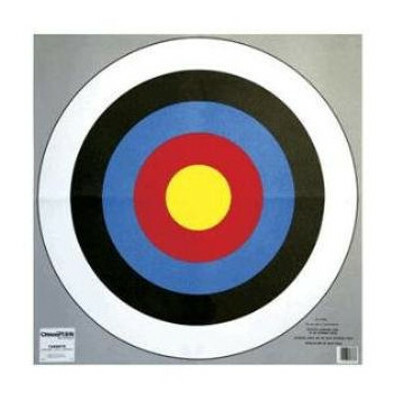 Read Champion slingshot target reviews. It’s self-healing so that you can get more use out of it. It’s made out of durable nylon mesh. Dimensions: 24 x 12 x 24 inches. QCan it be left outside? Not all targets are durable, and this can end up costing you a lot of money over time. However, with this Spyder target, it certainly lasts the distance. It doesn’t fade, it can be left outside, and it can take countless hits. It’s top-rated on the market and has plenty of glowing reviews as well. Check out what other people who purchased this product think about it. 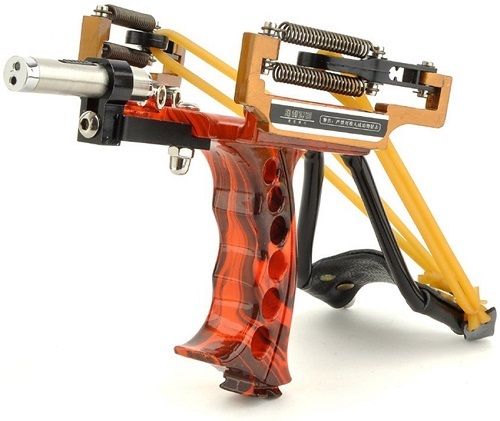 Read Spyder slingshot target reviews. It offers multiple targets to extend your shooting time. It’s suitable for both professional and casual use. It’s not as durable as other targets for sale. The sheets are folded so there are crease marks that can be distracting. Dimensions: 11.5 x 8.8 x 1 inches. QIs it on card or paper? 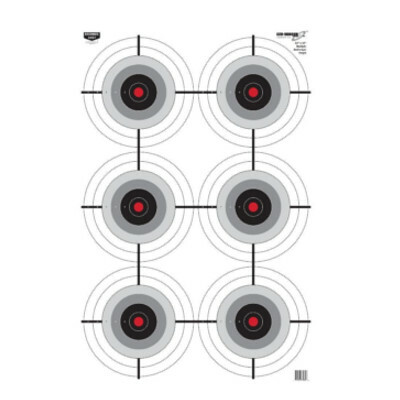 If you’re looking for a cheap target for practice, these Birchwood targets meet the mark. They are very affordable for a range of users and offer a challenge with six different targets to hit. The only problem is, they aren’t very durable. They can’t be left outside and they are only made of paper which is easy to tear. Check out what other people who purchased this product think about it. Read Birchwood slingshot target reviews. They can only be used once as they shatter. They are small which can make them more difficult to hit. The holders break as quickly as the discs do. QHow many disks do you get? 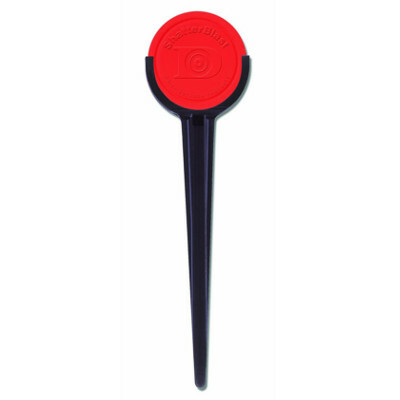 These Daisy target stakes are proving to be popular with slingshot users who want to test their skills on smaller targets. They provide a good challenge, shatter when hit, and are biodegradable as well. 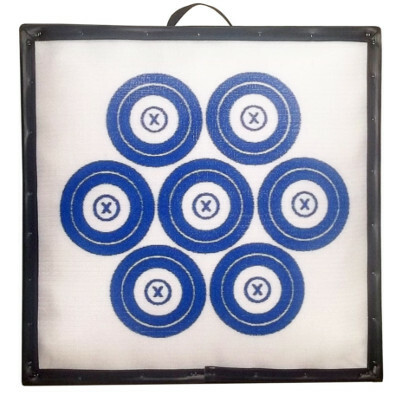 Priced very competitively, it’s clear to see they are some of the best slingshot targets for the money. Check out what other people who purchased this product think about it. Read Daisy slingshot target reviews. It’s made of canvas fabric with a steel frame to be exceptionally durable. The fabric is relatively sound-proof. It can be assembled and disassembled with ease. It has a back net so you don’t lose any ammo. The targets within it aren’t standard targets – they appear to be made out of scrap plastic and metal. Dimensions: 15.8 x 15.8 x 15.8 inches. QIs it easy to assemble? QCan the targets be changed? If you’re looking for a target for shooting that differs from everything else on the market, this Smarty target could very well be the answer. It’s made of durable canvas, is easy to assemble, and is priced exceptionally as well. While the targets themselves are a little strange, you can change them for your own, and still get to use the convenient box with a netted back as well. Check out what other people who purchased this product think about it. 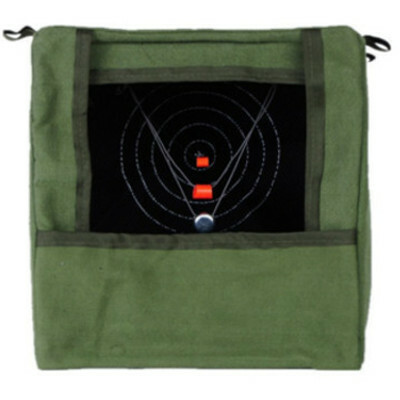 Read Smarty TB-1 slingshot target reviews. Where to Buy Slingshot Target? When you’re looking for slingshot targets for sale that cost very little to purchase, it’s always best to try your luck online. Websites such as Amazon.com feature thousands of slingshot products including targets that are both affordable and effective. However, you need to pay careful attention to the material used in comparison to the cost to ensure you really are getting the best deal.